Fare: British Airways (BA) ANNZ90S7 LON to JNB. Price: from £2,299 (£1,760 base fare + taxes & surcharges). Seasonal restrictions: permitted 23NOV 18 through 18DEC 18 for the first international sector. Flight restrictions: travel between Europe and Africa must be on any BA flight. Stopovers: 2 free stopovers permitted. Sales restrictions: reservations must be made on/before 05DEC 18. 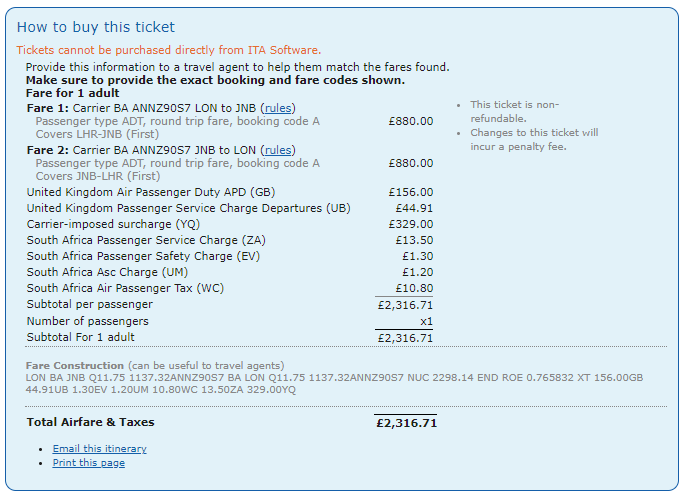 Cancellations: charge £00 for cancel/refund. Changes: charge £300.00 for reissue/revalidation.